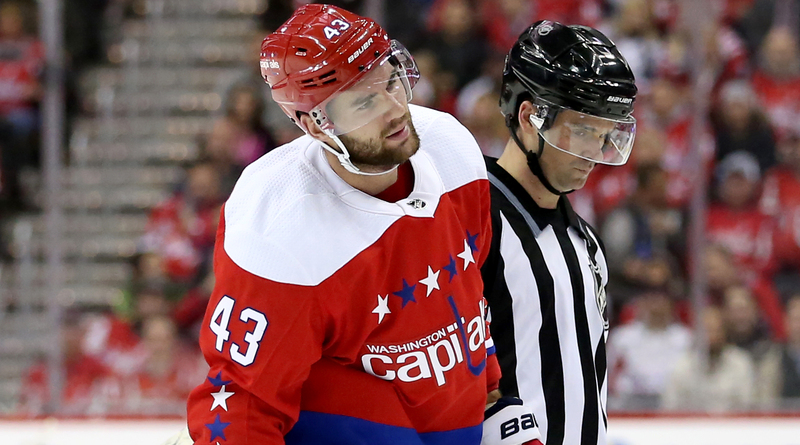 Tom Wilson made it back on the score sheet on Friday night but he also made it back under the NHL's microscope. Wilson was assessed a match penalty and ejected from the game after a hit to the head of New Jersey Devils forward Brett Seney. The incident happened late in the second period when Seney was hit with his back to Wilson. Seney was helped to his feet by the Devils' training staff and was able to skate off the ice on his own and eventually returned to the game for the beginning of the third period. Fridays game was only Wilson's ninth of the season after returning from a 14 game suspension (which was reduced from 20) for a hit on St. Louis Blues forward Oskar Sundqvist. So lets break down the hits. As you can see, the two hits have some similarities except with the hit on Sundqvist, Wilson comes in from the side and it is more intentional and aggressive than the hit on Seney. The hit on Seney looks like it's more incidental contact. Wilson has to be aware that the NHL has a close eye on him and he even said that he needs to change the way he plays. So was the hit intentional? Wilson has been playing good hockey since his return. He has seven goals and 13 points in nine games, he extended his goal streak to five, which is a career best, and his point streak to seven games. It's unfortunate for Wilson considering the fact that he's actually trying to turn his game around and has the potential to be a big impact player in the NHL and for the Washington Capitals. Hopefully he can stay away from plays like this and continue to be a key piece that the team needs.